Jerseys, tshirts, socks, hats, pint glasses…there’s lots of Glacier Cyclery branded goods available for purchase in the shop and on our online store. 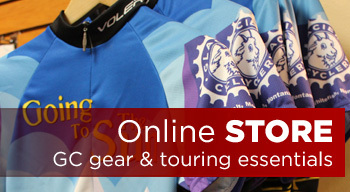 We have several custom Glacier Cyclery jerseys from Voler including the popular Going-To-The-Sun jersey, socks from Sockguy, water bottles, hats and traditional cycling caps and ball caps, many t-shirts, hoodies, gift cards, pint glasses and mugs and, of course, stickers! Glacier Cyclery carries clothing from a number of reputable companies such as Pearl Izumi, Dakine, Fox, Zoic, Giant and more. We’ve got you covered from gloves to baggy shorts to timeless black lycra. We also sell raingear and booties and cold weather gear for that unpredictable Montana weather, shoes from Giro and 5.10, and Tifosi eyewear. Helmets are getting safer AND more comfortable, and that is technology we can get behind. There’s lots of choices on the Glacier Cyclery helmet wall: full-face, removable chin guard, MIPS, road, mountain and recreational helmets from Fox, Giro, Bell, and Giant. Try one on. Ahhhhh… like your favorite ball cap only much more impact resistant. Glacier Cyclery sells numerous accessories, too many to list completely, but here’s a smattering of our offerings. 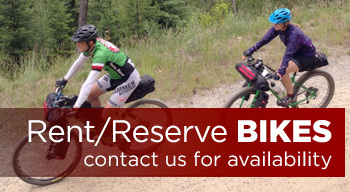 Bags and panniers from Revelate, Topeak, and Jandd, racks (bike & auto), tires that we know, love and use; bear spray that we know, love and hope we don’t have to use; parts and accessories from Shimano, SRAM, Race Face, Maxxis, WTB, Campy, and more – and almost every rear derailleur hanger design known to man. Local maps, maps to Adventure Cycling’s routes… the list goes on and on. 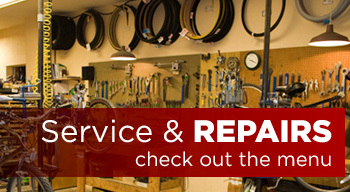 Stop by Glacier Cyclery to touch, see, buy and use!